Snoring is a common problem that affects as many as 50% of people in the world. It is the harsh or rumbling sound a person makes while sleeping due to turbulent airflow that causes the soft tissues in the mouth and throat to vibrate. The snoring can be soft or loud, occur only during REM (Rapid Eye Movement) sleep or last all night. Some experts speculate that partners of snorers lose up to an hour of sleep every night because of their bed mates’ snoring. In many cases, snoring serves as an indicator of an underlying medical problem such as obstructive sleep apnoea. Snoring is something many people has an issue with, yet they just do not feel there is a cure to this problem, so they just go about their lives and accept it. Learning how to effectively treat your snoring is key, so read on for some tips which should help you do just that. Primary snoring (simple snoring) is not associated with sleep disturbances like apnoea. Basically, a person snores because of mild airway obstructions that cause the soft tissues to vibrate. Although annoying to others, this type of snoring is harmless. Snoring is also associated with upper airway resistance syndrome (UARS), which is mild airway resistance that may cause transient arousal during the night. It is not as severe as sleep apnoea but can cause the same daytime sleepiness and fatigue. Obstructive sleep apnoea is severe airway resistance due to a serious obstruction. It causes significantly reduced oxygen levels and arousal from sleep is more frequent because a person often stops breathing during the night because of the obstruction. In addition to snoring, people with this condition may experience headaches, dry mouth upon waking, difficulty concentrating, and mood disturbances. It is the most common type of sleep-disordered breathing condition. Snoring is one of the most common sleep disorders. In most cases, it is not terribly serious, but at times it can be an indication of a more troubling disorder. Knowing what is snoring, is the first step to finding a way to rid you of this condition. Essentially, snoring occurs when your respiratory structures vibrate during your sleep. It can vary widely in volume, from a soft buzzing to a loud, unpleasant roaring noise. Loud snoring can make it very difficult for other people in the bedroom to sleep. There are a number of different conditions that can cause you to snore. Identifying the cause of your snoring is the first step to finding an effective form of treatment that will let you get a better night’s sleep. One common cause of snoring is a stuffy nose. If you find yourself only snoring during allergy season, your problem is almost certainly a side effect of your allergies. When your nose is congested, air has a harder time getting into your respiratory tract, which can lead to snoring. Other conditions can also obstruct your nasal passages. The septum is the structure that separates your nostrils, and any type of deformity in the septum can result in snoring. Nasal polyps are another possible cause of snoring. If the muscles in your tongue or throat become too relaxed when you are sleeping, they can collapse to the back of your throat. This will also obstruct your airway, therefore causing you to snore. As you grow older, these muscles gradually relax, making it more likely that you will snore at night. When you are overweight, you are more likely to learn what is snoring. The more you weigh, the more likely you are to snore. Being overweight can cause you to have bulky throat tissue. This means that your airways will be more easily obstructed. Snoring can also be an indication that you may be suffering from sleep apnoea. This is a potentially life-threatening condition in which people stop breathing for periods at night. This makes it more difficult to get a restful night’s sleep and can put a greater strain on the heart and the rest of the body. If you are concerned about your snoring, it can be a good idea to talk to your doctor. He can examine you to find out what is most likely causing your snoring, and prescribe treatments that can help. There are a few simple things that you can do to reduce your snoring. Sleeping on your back can exacerbate your snoring, so try using a sleep pillow to lie on your side at night. Avoid drinking alcohol before bed, and try to establish a regular sleep routine by going to bed at the same time every evening. 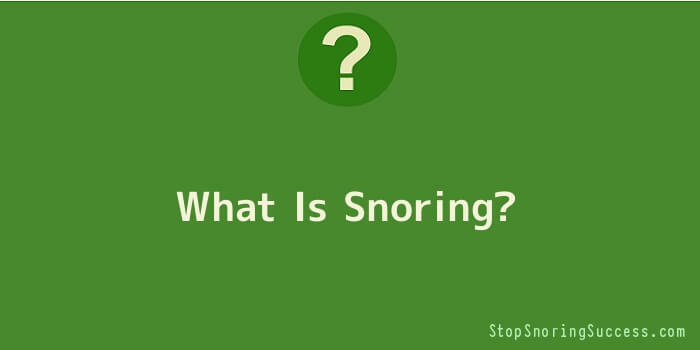 Asking yourself, “What is snoring?” is the first step to finding a cure for your condition. Before long, you and the rest of your family will be able to get a good night’s sleep again.